Epic Solutions now offers an electric gun raiser for your paint, epoxy, thermo, and MMA striping trucks. Raise or lower the height of the gun with just the press of a switch. Gives operator ultimate control without stopping. Can be used on both paint guns and bead guns. Using 12V power supply, the GR 1000 gives the operator the ability to increase/decrease the line width without having to stop the truck. The GR 1000 works with existing equipment and can be used in conjunction with the EPIC Solutions’ Timing System. 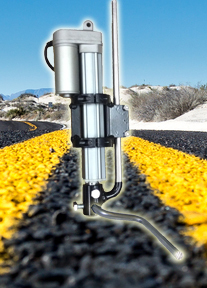 The GR 1000 can be installed on any truck, regardless of manufacturer. Can be used with any truck setup. No limit to the number of gun raisers per side. Works great for making quick adjustments to the line width when changes in material/environmental temperature arise.